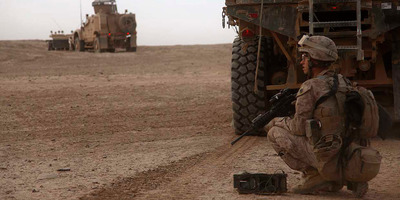 Flickr/Official U.S. Navy PageHospitalman Stephen Wescott, assigned to 3rd Battalion, 5th Marine Regiment, provides security during a census patrol in Sangin, Afghanistan, January 10, 2011. Marty Skovlund Jr., a US veteran of Afghanistan, went back to the country as part of a reporting project for Task & Purpose. Skovlund interviewed ranking and junior members of the Afghan and US militaries, and saw how the war is developing first hand. As someone with experience in the war, he believes that the war will last for much longer and get bloodier, but that he is “cautiously optimistic” about Afghanistan. Marty Skovlund Jr., a veteran of the 1st Ranger Battalion, recently made a trip back to Afghanistan, where he was deployed to in the aftermath of 9/11. He wrote about the trip – his first to Afghanistan in nearly eight years – for Task & Purpose. While in Afghanistan, Skovlund interviewed servicemen of the Afghan military, intelligence officials, and even a US brigadier general. “The United States leaving Afghanistan is about as likely as our leaving Germany, Japan, Korea, Italy, or most of the other 138 countries around the world where we maintain a military presence,” Skovlund writes. Still, the Taliban has shifted tactics, opting instead to guard their drug producing labs and conduct attacks on government positions. There is also the complication that ISIS adds to the region, with its affiliate ISIS-K. But Skovlund says he is “cautiously optimistic” about Afghanistan. “The violence will get worse before it gets better, and we won’t get the win we may have expected when we first invaded years ago,” he writes.